Johnsonville Sizzling Sausage Grill is the Ultimate Father's Day Gift Idea! Is there a Dad on your list that loves to grill, goes through grilling withdrawal during winter or maybe wishes he could get the get the grilled sausage taste without the high cost of a grill? 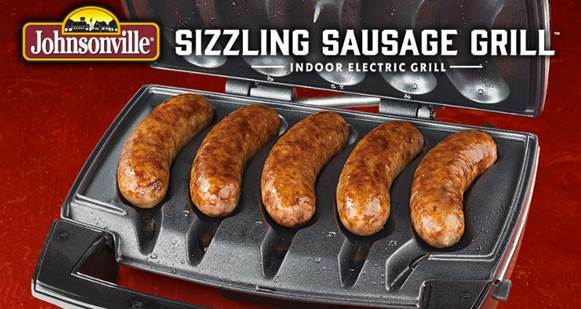 Then this Father's Day, get them the newly created Johnsonville Sizzling Sausage Grill! This unique grill ensures perfectly cooked Johnsonville Sausage EVERY time with just a simple push of a button. Who needs a panini press or waffle maker, when you can have a Sausage Grill??!! You can even take it on the road for tailgating or camping. Easy to store, easy to clean and easy to love. The best part about this sausage grill? It makes PERFECT SAUSAGES. EVERY TIME. Great sausages grilled in less than 15 minutes - any time of the year, in any weather. It is easy to use, easy to clean, easy to store. I love that the plates can be washed in the dishwasher for easy cleanup and it features a temperature sensor that ensure perfect sausages EVERY TIME! It is perfect for homes, apartments, RVs or college. It really is the ultimate Father's Day gift for the griller, tailgater, sausage lover in your life! You can purchase the Johnsonville Sizzling Sausage Grill for $99.98 from their website.